Apart from Waisai City, Sorong also becomes an important checkpoint in Raja Ampat. Thanks to the presence of Sorong Port and Domine Eduard Osok Airport. People are able to reach many islands, which are located in the archipelago. Moreover, Sorong also has several worthy vacation destinations for tourists. One of them is called Tanjung Kasuari Beach, which is considered an oasis. The location is quite comfortable and shady, so it is suitable for relaxing and sightseeing. The beauty of the seascape is definitely mesmerizing! he color of the sand is creamy. 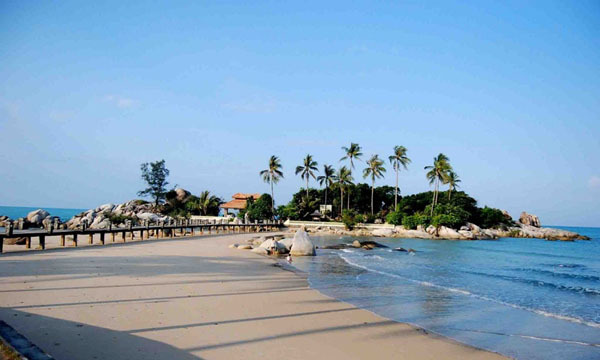 Though, some parts of the beach have white sand and are suitable for beach walking. There is also a specific part, which is covered by lush vegetation and coconut trees. Several reefs are also seen there. When it comes to sea water, it has moderate waves and warm temperature. Swimming is possible, but it is not recommended for kids. In a nutshell, Tanjung Kasuari Beach emits a comfortable nuance. The best time to visit the location is during summer when the weather is nice and has low rainfall. It is true that the beach comes with a neat and clean environment. No wonder, it is suitable for sightseeing. The seascape is flawless, appearing like an oasis of a desert. The heat of the sun in Sorong City becomes nothing due to the presence of such beautiful and shady beach. Apart from sightseeing, the location is also suitable for relaxing. Tourists can simply sit under coconut trees and enjoy the breezy wind. The pure seawater makes it more appealing to visitors, in fact. The next thing to do in Tanjung Kasuari Beach is swimming. As mentioned before, the water has moderate waves and a comfortable temperature. Adults can safely get in the water and swim there. The thing is kids should be under parents’ supervision when dipping in the water. It is also because the currents can be too much strong unpredictably. As an alternative, they can play sand on the shoreline. Building a sand castle is a suitable activity for kids, after all. It is both fun and challenging. The beach is quite crowded in weekends. For those looking for a peaceful vacation, it is better to come during working days. With a serene atmosphere and comfortable nuance, Tanjung Kasuari Beach feels like a private coast. As for the tip, tourists should carry a camera and some snacks. This way, they can take some pictures of the beach and have lunch with their families there. As an alternative, they can go back to Sorong City and try local foods in nearby eateries. What a vacation! From Jakarta, it involves a flight to Domine Eduard Osok Airport and the destination is Sorong City. From there, tourists can take “angkot” or minibus to Kasuari Beach. The fee is a bit pricey, though. When it comes to the duration, the trip takes about 30 minutes. It is a worthy vacation!